Markets gained momentum in the latter half of the trading session, amid firm European cues, to end higher led by ONGC and private banking major ICICI Bank extending gains. The S&P BSE Sensex ended up 102 points at 28,179 and the Nifty50 ended up 16 points at 8,709. In the broader market, the BSE Midcap ended down 0.1% while the Smallcap index ended up 0.5% each. Market breadth ended firm with 1681 gainers and 1171 losers on the BSE. "Early sluggishness was wiped off on positive cues from European markets and after PSU banks added further gains ahead of a meeting of senior management of banks today to discuss the bad loans issue in specific sectors, including steel, power and infrastructure. However, with more banks’ earnings scheduled from tomorrow onwards, caution emerged, capping gains. Markets are also following the dollar’s strength ahead of FOMC rate decision and US presidential elections." said Anand James, chief market strategist, Geojit BNP Paribas Financial Services. Foreign institutional investors were net sellers in equities worth Rs 273 crore on Friday, as per provisional stock exchange data. Asian markets ended firm on Monday with shares in China and Hong Kong gaining the most in the region. The Shanghai Composite ended up 1.2% while Hang Seng gained 1%. In Japan, the Nikkei ended up 0.3% while the Straits Times ended up 0.9%. European stocks gained on Monday on the back of robust manufacturing PMI data from France and Germany. Germany's DAX was up 0.8% while CAC-40 was up 0.7% and FTSE-100 was up 0.2%. 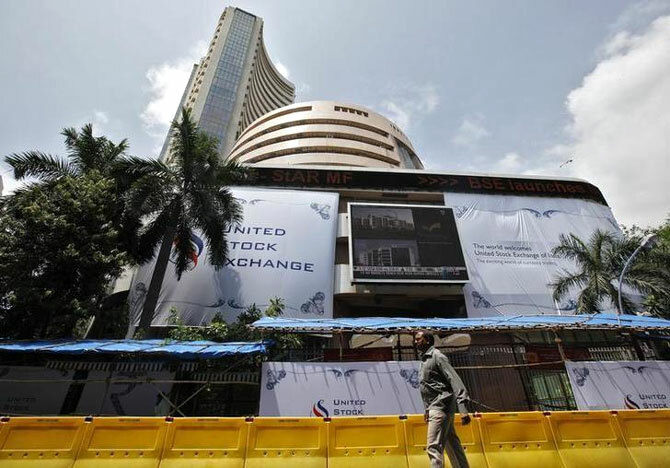 Axis Bank, Adani Enterprises, Bharti Infratel, GSFC, Idea Cellular, Indiabulls Real Estate, K P R Mill, Navin Fluorine International, Rallis India and Reliance Capital will announce their second quarter earnings today. Stocks of housing finance companies have given steady returns to shareholders for several years, as demand for home loans has remained firm in the country. The initial public offer (IPO) of PNB Housing Finance, a stable company from the sector, offers similar prospects for long-term investors. The company plans to raise Rs 3,000 crore through an initial public offering in the price band of Rs 750 - Rs 775 per equity share. State-owned oil exploration major ONGC emerged as the top gainer up nearly 5% after the company said its the board will meet on Thursday, October 27, to consider a proposal for issue of bonus equity shares. ICICI Bank continued its winning streak with 2% gain on the back of buying interest on expectations that it would receive its dues after the Essar Group recently signed a binding agreement with Russia’s Rosneft, United Capital Partners and Trafigura Group Pte. to sell 98% in its most priced asset, the 20 million tonnes per annum Vadinar refinery and Vadinar port in Gujarat. The stock gained over 2%. Telecom stocks witnessed profit taking after the Telecom Regulatory Authority of India (Trai) has proposed a penalty of about Rs 3,050 crore on three telcos - Bharti Airtel, Vodafone and Idea Cellular - for failing to provide sufficient interconnect points to Reliance Jio, leading to massive call failures. Bharti Airtel eased nearly 1% while Idea Cellular ended down 2.6%. Wipro was the top loser down 3% amid a brokerage downgrade on the stock after the IT major cited market uncertainty as it forecast slower growth in the quarter ending December. For the third quarter (Oct-Dec 2016), the IT major said revenue would grow in the band of zero to two per cent. It has been growing in a single-digit band for four quarters even as its peers have fared better. Lakshmi Machine Works ended up 5% after the company said the board will meet on Wednesday, October 26 to consider a proposal for buyback of equity shares. Mindtree ended nearly 5% lower after the company’s consolidated net profit declined 23% to Rs 95 crore for the quarter ended September 2016 (Q2FY17) on sequentially. V-Guard Industries surged 5% after it reported a robust 70% year on year (YoY) jump in net profit at Rs 39 crore for the quarter ended September 2016 (Q2FY17), on back of strong operational performance. Tata Teleservices (Maharashtra) ended locked in 20% upper circuit at Rs 7.50 on BSE. According to PTI reports, Tata Teleservices made a payment of about Rs 2,300 crore to Department of Telecom (DoT) for airwaves it bought in the just-concluded auction.